For the last few decades, the 4% rule has served as the cornerstone of modern retirement theory. However, with 10,000 baby boomers retiring every day and many Americans worrying about being able to afford retirement, in recent years many have begun to question whether or not this rule of thumb is still the best chance at maintaining a comfortable income in their golden years. Let’s take a closer look at the pros and cons of the 4% rule, as well as if high-yield, dividend growth investing may be an appealing alternative choice to consider for meeting your long-term income needs. The 4% rule is derived from the work of William Bengen, an accountant who conducted a well-known study in 1994. Bengen found that a 60% stock / 40% bond portfolio, combined with an annual inflation-adjusted 4% sale of one’s assets, would be sufficient to fund a comfortable retirement and not risk running out of money for at least 30 years. Here’s how it works. Imagine that starting at the age of 30 you began saving $1,000 per month into a diversified 60/40 stock/bond portfolio and achieved a historical return of 8% per year. By the time you were ready to retire at 65, the $420,000 you had saved over the years would have grown to about $2.2 million. In your first year of retirement you would sell 4% of your portfolio, worth $89,329, which would fund a comfortable retirement. Each year you would adjust this amount by the rate of inflation (historically 3% to 4%), and since your portfolio’s inflation adjusted return was 4% to 5%, you would theoretically never run out of money. Investors can check out various retirement calculators online to better understand their future income scenarios. However, while the 4% rule is a solid, conservative starting point from which to plan your retirement, you need to be aware that there are three major risks to trusting it with your future. The first problem with the 4% rule is that it assumes several things that may not play out in the future. First, the 4% withdrawal rule assumes that both stocks and bonds will continue generating similar returns as they have in the past. However, this assumption could prove problematic, especially regarding bond returns. As you can see, the yield on risk-free assets, such as 10-year U.S. Treasuries, has been falling since 1982 and remains near an all-time low. This poses two major problems for the 4% rule. First, the primary reason for holding bonds is to diversify your portfolio and minimize the risk of a short-term decline in value. Historically, this has worked for two reasons. Bonds provided a steady and guaranteed income which investors could count on to fund short-term needs, such as retirement expenses. In addition, because of their stable cash flow and guaranteed return of capital (at the maturity date), bonds served as good risk hedges. When markets crashed, frightened investors would bid up bond prices in a flight to safety, which helped to offset stock losses in a diversified portfolio. So what has potentially changed over the years? For one thing, yields on bonds have fallen to record lows, which means that the guaranteed income you are now getting from buying Treasuries is paltry and just barely keeping up with inflation at best. 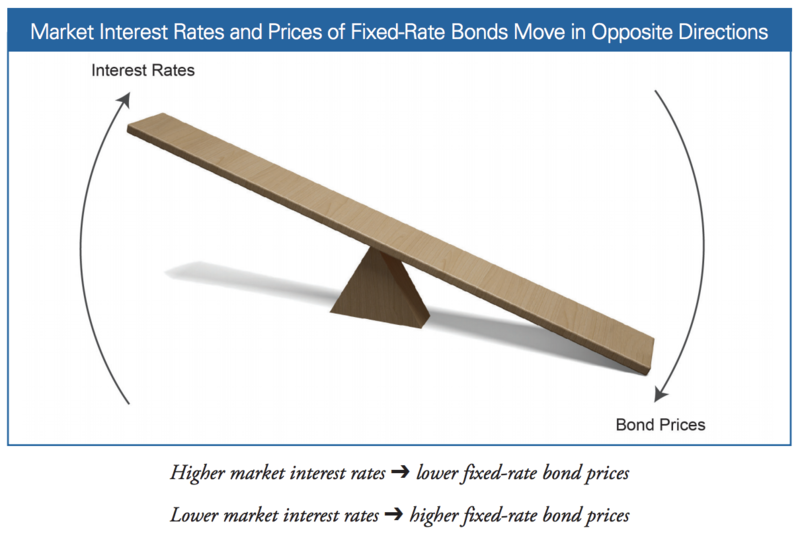 Since bond yields generally trade in the opposite direction of interest rates, a rising interest rate environment could mean an end to the 35-year bond rally that began in the early 1980s. Think of it like this. Suppose you buy a freshly minted 10-year Treasury paying a 3% coupon. If interest rates rise by even just 1 percentage point, then the amount that other investors are willing to pay for that bond must decline. That’s necessary in order for the bond’s yield to rise to levels that are competitive with new, higher-yielding bonds. Now if you are holding the bond until maturity, that won’t harm you (other than the lost opportunity to invest in higher-yielding assets). But remember that the 4% rule says you have to sell 4% of your portfolio, including bonds, every year. This means that if you are close to or already retired, the short-term decline in bond prices could force you to take a loss on your bond investment. In fact, a 10-year Treasury bond would decline by about 30% if interest rates rise by 3 percentage points. Or to put it another way, once you are already retired and selling 4% of your portfolio each year, even risk-free Treasury bonds could end up eroding your nest egg. The capital loss would be far more than the small yield you are paid to take this kind of risk. The next major risk with the 4% rule is that it is based on long-term market performance. While it is true that the U.S. stock market has returned close to 10% per year since the late 1800s (including reinvested dividends), the problem is the market’s returns over shorter periods of time can be very volatile. This is especially true when stocks are trading at relatively high valuations, such as they appear to be today. When stocks are trading at historically high valuations, the returns over the short to medium term can be very disappointing. For example, during the so-called “lost decade” between 2000 (tech bubble) and 2010, the market’s total return was a painful -14% over the entire 10-year period. All of this means that investors need to be prepared for potentially low returns over the next few years and possibly even a sharp correction. During market drops, such as the 2000 tech crash and the 2008-2009 financial crisis, the 4% rule can cause a lot of stress for retirees and potentially fail some of them altogether. After all, if your portfolio declines by as much as 50% as it did in both of the last two crashes, then sticking to the 4% rule will result in a 50% reduction in income compared to the prior year. Many retirees simply don’t have a large enough nest egg to allow such a decline in income due to fixed medical and housing expenses. In that case, you may be forced to withdraw far more, say 8%, which means selling at the worst possible time – the bottom of a crash. This can be when stocks are most undervalued and about to take off as they did starting in March 2009. In other words, rules-based formulas like the 4% rule can make you into a short-term forced seller, parting with your hard-earned assets at fire-sale prices. Doing so could very well result in a permanent loss of capital and future earnings power, which brings us to the biggest risk of all – running out of money. For example, according to a study by the MacArthur Research Network on an Aging Society, by 2050 American women and men will be living to 89-94 and 83-86 years old, respectively. But what is potentially even scarier is that 25% of retirees could live past 90 while 10% will live past 95, according to the Social Security Administration. In other words, the 4% rule, which is based on long-term historical bond and stock market returns that seem unlikely to occur over the next 10 years, could result in a retiree running out of money during their lifetime. So what is a person to do in order to maximize the chances of maintaining a long-term and prosperous retirement in these highly risky times? One potential answer to consider is utilizing a portfolio of high-yield dividend stocks to generate a portion of your income in retirement. In 2008, a study by CPA Jack Gardner discovered something amazing. Between 1968 and 2007, investing in the top 100 yielding stocks in the S&P 500 would have resulted in annualized total returns of 13.5% compared to just 10.5% for broader index. The difference in performance between high-yield stocks and the broader market was so powerful that even William Bengen (the father of the 4% rule) concluded that investors following this approach could safely increase their annual withdrawal rate by 25%, from 4% to 5%. Of course, this amended “5% rule” still faces many of the same risks as the older one, mainly that volatile short-term bond and stock returns could still result in highly unpredictable and insufficient income in any given year of retirement or retirees outliving their savings. However, this is where the power of conservative, high-yield, dividend growth investing comes in. Specifically, because of the high-yields of quality, safe income stocks such as Verizon (VZ) and others, investors can negate many of the short-term risks that plague the 4% (and 5%) rules. Let’s use our Conservative Retirees model dividend portfolio to show how it works. This portfolio targets high-quality, high-yield stocks with long-term track records of paying safe and growing dividends. Specifically, the portfolio targets a safe dividend yield between 3.5% and 4.5%, annual dividend growth in excess of the rate of inflation, and moderate capital appreciation with less volatility than the broader market over the long term. But what about the short term? After all, most retirees can’t wait five to 10 years for markets to recover from a crash. That’s where the greatest advantage of investing in high quality dividend growth stocks kicks in. Since the dividends of such a portfolio can remain stable and even grow during times of extreme market and economic uncertainty (such as 2000 and 2008-2009), investors who rely on this kind of portfolio don’t have to worry so much about income falling as it would with the 4% rule. Remember that as long as the dividend paid by a company remains secure (and growing) due to a strong balance sheet and sufficient cash flow, the short-term stock price volatility doesn’t really matter. In fact, if your portfolio is large enough that your dividend stream covers more than your expenses, then even in retirement you might be able to take advantage of periodic market panics and crashes by reinvesting a portion of those dividends into higher-yielding shares. In other words, whereas the 4% rule can potentially result in decreasing income and outliving your savings, by leaning on dividends you can benefit from a growing income stream that secures your standard of living. And since the dividends can collectively grow at a mid-single-digit annual pace, the rising dividends are generally more than enough to offset inflation, too. Best of all, a conservative dividend growth strategy can help ensure that you will never outlive your savings, no matter how long you live. Your children and grandchildren will certainly appreciate this strategy as well since it’s likely to leave a larger inheritance to your descendants (one in which the capital gains are reset to zero when you do pass on). While living off just the dividends of your high-yield portfolio (and thus never having to sell shares) is an appealing strategy compared to the 4% rule, there are several caveats that you need to keep in mind. In order for this strategy to work, you need to start saving and investing early enough and learn to master your emotions. For example, if you have only 10 to 15 years until retirement, then the wealth compounding benefits of the market might not have enough time to grow your portfolio large enough to allow you to just live off the dividends during retirement. The same applies if you can’t save enough of your income. For high-yield dividend growth investing to give you the kind of retirement you want, you need to follow three very important rules. 1) Start as early as possible. 2) Live beneath your means as much as is comfortably and sustainably possible (save and invest as much as you can). 3) No matter what, never attempt to time the market, and learn to control your emotions so you can be a true long-term, buy-and-hold investor. By following these three simple rules, and given enough time and consistent savings, dividend growth investing can give almost anyone a prosperous retirement. Besides the requirements of time and capital, generating enough retirement income from dividend stocks rather than following the 4% rule has another risk to consider – dividend cuts. Take one of the most popular dividend ETFs out there – Vanguard’s High Dividend Yield ETF (VYM). During the financial crisis, VYM's dividend payments declined from $1.44 per share in 2008 to $1.09 in 2010, representing a total decline of about 25%. The fund’s annual dividend payments didn’t recover back to their 2008 peak until 2012. That’s a long time to wait, and no one knew if and when a recovery was coming. Dividend Safety Scores can help income investors avoid companies that are most at risk of cutting their dividends over the course of a full economic cycle. However, no one knows what the next economic downturn will look like or when it will happen. Essentially, investors pursuing a retirement strategy of buying high-yield dividend stocks rather than selling assets to fulfill the 4% rule need to remain mindful that a dividend income stream is not guaranteed to be completely safe each year. Steps can be taken to reduce risk, such as using Dividend Safety Scores and maintaining enough cash on hand to cover a year or two of living expenses, but there are never any guarantees in investing. There are pros and cons to using the 4% rule or generating retirement income from higher-yielding dividend stocks. Under the 4% rule, determining a reasonable asset allocation for your portfolio and periodically selling off assets can be an uncomfortable process, particularly in today’s unprecedented era of record low interest rates and relatively high valuations. Investing in high quality dividend stocks can be a compelling alternative because it takes some of the emotional stress out of retirement planning. Investors with large enough portfolios don’t need to worry about selling their shares or responding to unpredictable stock and bond market movements since they can largely live off the dividends their portfolio pays each year. However, income from most high dividend stocks will never be as safe as income from Treasury bonds. Roughly one in three dividend-paying stocks in the S&P 500 reduced their dividends during the financial crisis, for example. Dividend Safety Scores can help investors avoid many of these companies, but it’s important to be realistic about the amount of safe income you can generate each and every year from stocks and invest accordingly. On the other hand, investors following the 4% rule likely faced a major dip in income during the financial crisis and were also faced with the tough decision of which assets to sell off in order to meet their standard of living needs. Many investors likely fall somewhere in between the 4% rule and investing exclusively in dividend-paying stocks because of the size of their portfolios, the income they need in retirement, and their unique risk tolerances. The most important thing is to remain aware of the tradeoffs of both approaches and make the best decision for your own needs.